Evaluation is the assignment of sym­bols to phenomenon, in order to characterize the worth or value of a phenomenon, usually with reference to some cultural or scientific standards. The term evaluation is closely re­lated to measurement. It is in some respect, inclusive in­cluding informal and intuitive judgement of pupil’s progress. Evaluation is describing something in term of selected attributes and judging the degree of acceptability or suitability of that which has been described. Evaluation is a systematic process of collecting, analysing and interpreting in­formation to determine the extent to which pupil’s are achievement instructional objectives. The process of ascertaining or judging the value or amount of something by use of a standard of standard of appraisal includes judgement in terms of internal evidence and external criteria. From the above definitions it can b said that evaluations a much more comprehensive and inclusive term than the meas­urement and test. A test is a set of question measurement is assigning numbers to the results of test according to some specific rules on the other hand evaluation adds value judgement. For example when we say Rohan secured 45 numbers in Arith­metic. It just indicates ‘how much’ Rohan has successfully answered. It does not include any qualitative description i.e. ‘how good’ he is in Arithmetic. Evaluation on the other hand includes both quantitative description (measurement) and qualitative description (Non measurement) along with value judgements. This relationship between measurement, non measurement and evaluation can be illustrated with the help of following diagram (1.1). Evaluation is a sys­tematic process of determining to what extent instructional ob­jectives has been achieved. Therefore evaluation process must be carried out with effective techniques. A teacher must be clear about the purpose of evaluation. He must formulate the instructional objectives and define them clearly in terms of student’s observable behaviour. Before selecting the achievement measures the intended learning out comes must be specified clearly. It is not possible to evaluate all the aspect of achievement with the help of a single technique. For the better evaluation the techniques like objective tests, essay tests, observational techniques etc. should be used. So that a complete’ picture of the pupil achievement and development can be assessed. Evaluation can be done with the help of simple observation or highly developed standardized tests. But whatever the instrument or technique may be it has its own limitation. There may be measurement errors. Sampling error is a common factor in educational and psychological meas­urements. An achievement test may not include the whole course content. Error in measurement can also be found due to students guessing on objective tests. Error is also found due to incorrect interpretation of test scores. Every evaluation technique is appropriate for some uses and inap­propriate for another. Therefore while selecting an evaluation technique one must be well aware of the strength and limitations of the techniques. The evaluation technique is used to take decisions about the learner. It is not merely gathering data about the learner. Because blind collection of data is wastage of both time and effort. But the evaluation is meant for some useful purpose. The main aim of teaching learning process is to enable the pupil to achieve intended learning outcomes. In this process the learning objectives are fixed then after the instruction learning progress is periodically evaluated by tests and other evaluation devices. Learning outcomes expected from class-room discussion can be fixed by using evaluation results. What type of knowledge and understanding the student should develop? What skill they should display? What interest and attitude they should develop? In the teaching learning process it is very much necessary to know the needs of the learners. The instructor must know the knowledge and skills to be mastered by the students. Evaluation helps to know whether the students possess required knowledge and skills to proceed with the instruction. An evaluation process helps the teacher to know the learn­ing difficulties of the students. It helps to bring about an im­provement in different school practices. It also ensures an ap­propriate follow-up service. Programmed instruction is a continuous series of learning sequences. First the instructional material is presented in a limited amount then a test is given to response the instructional material. Next feedback is provided on the basis of correctness of response made. So that without an effective evaluation process the programmed learning is not possible. Cur­riculum development is an important aspect of the instructional process. Evaluation data enable the curriculum development, to determine the effectiveness of new procedures, identify areas where revision is needed. Evaluation also helps to determine the degree to what extent an existing curriculum is effective. Thus evaluation data are helpful in constructing the new curriculum and evaluating the existing curriculum. A systematic evaluation procedure provides an objective and comprehensive picture of each pupil’s progress. This com­prehensive nature of the evaluation process helps the teacher to report on the total development of the pupil to the parents. This type of objective information about the pupil provides the foun­dation for the most effective co-operation between the parents and teachers. 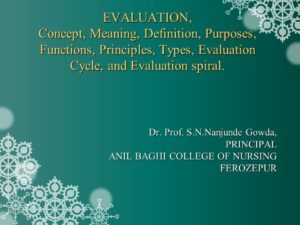 Evaluation procedures are very much neces­sary for educational, vocational and personal guidance. In order to assist the pupils to solve their problems in the educational, vocational and personal fields the counsellor must have an objec­tive knowledge of the pupils abilities, interests, attitudes and other personal characteristics. An effective evaluation procedure helps in getting a comprehensive picture of the pupil which leads to effective guidance and of counselling. Evaluation data helps the administrators to judge the extent to which the objectives of the school are being achieved, to find out strengths and weaknesses of the curriculum and arranging special school programmes. It also helps in decisions concerning admis­sion, grouping and promotion of the students. In order to make the school programme more effective, researches are necessary. Evaluation data help in research areas like comparative study of different curricula, effectiveness of different methods, effectiveness of different organisational plans, etc.